There’s only one month left until we head off on our family gap year trip! The planning and logistics are pretty overwhelming – a lot of lists are made and re-made – and there is still much to do. It seems like every day something more gets added to the list. Where are going? some of you may be asking. We have been keeping things a bit under wraps until I could give notice at work, but now that’s done I can post more about our plans and status updates. Our (very loose) plan is to spend two weeks driving to the port in Halifax and to drop off Harvey, our motorhome, for shipping to Belgium. We will then fly back to Ontario and visit family for a few weeks while Harvey has his adventure crossing the Atlantic. We originally planned to fly to Germany from Halifax and take a holiday in Belgium while Harvey is en route, but then we costed out that plan and realized we’d rather save that money. Train travel and hotel rooms for a family of four adds up quickly, especially in Western Europe! When Harvey is due to arrive in Belgium we’ll fly over there to pick him up, and then the real adventure begins! 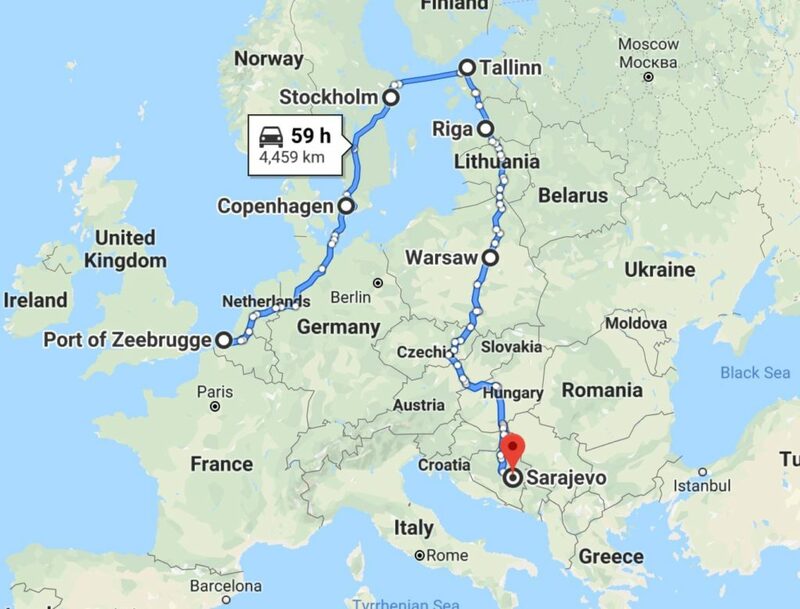 We hope to visit a friend in Copenhagen, then take a car ferry to Tallin in Estonia, and then make our way south through central and eastern Europe. Harvey is off-grid ready (we think), and we hope to free camp most of the time (more on this in future posts), take it all at a pretty relaxed pace, and just enjoy not working, Europe, and spending time with our kids. A week ago we said a bittersweet goodbye to our little house and made way for our tenants. We moved to our hometown about two hours away and are housesitting for a family member for the month while we prepare to leave. And so he does. Believe it, and you’ll live it, right? I gave my employer of ten years a month’s notice of my resignation (I won’t lie, I felt about 20 pounds lighter within minutes) and so I’m still working at the moment. Wandering Family Man is looking after Wandering Family Girl (2) at home, doing some freelance web development, and work on Harvey. 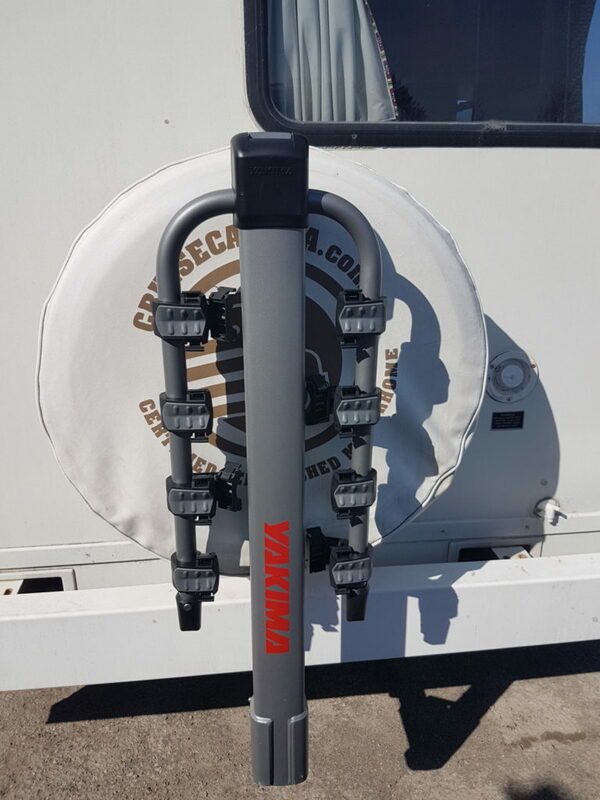 This week, Harvey acquired a stylish new Yakima LongHaul RV bike rack that exactly fit over the spare tire (whew! we thought we were going to have to leave the spare at home) and LED light bulbs (they use way less electricity), and lost his toilet. Cassette toilets are used in RVs Europe, not black tanks, so we’re the proud (?) new owners of a Thetford 365 cassette toilet. We have so much more to do – Wandering Family Boy needs a new passport, Harvey’s heading in for a full mechanical check next week, I’m researching travel medical insurance and European camper insurance…and eventually we’ll have to pack! It’s overwhelming but exciting, and one bonus of being so busy is that we don’t have much time to dwell on our anxieties about the trip. Where on the spectrum between ‘pleasantly different’ and ‘anxiety-disorder inducing’ will driving a North American RV in Europe, be? Is Harvey sufficiently secure against theft? Is our plan to park Harvey on the outskirts of towns and cycle to the nearby sights and shops, realistic? Keep in mind we’re new to RVing. We’ve not yet had to fill our propane tank, even, and at the moment, don’t know how! But hey, we have a month to learn, right? While we will post personal updates to the blog like this periodically, our more frequent mini-updates are on our Facebook page and Instagram. You can follow those accounts using the Follow buttons on the upper right of this page. We look forward to following you on your adventure, happy travels!